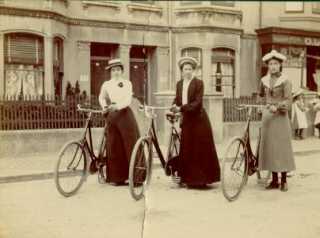 The photograph of the three lady cyclists was taken in Cowper Street c1905. Can anyone say for sure if the shop was on the corner of Cowper Street? I am pretty sure it is and if so I lived there when I was 8 years old in 1950 and my stepfather had it as a Barber’s shop. The shop is still there and is a wood merchants now. No, the bicycle shop was not a corner shop, it was a few doors along on the North side, the Mongomery St end. My Great Uncle used to own it (Alfred Marsh) after he sold the business, the name (Marsh Cycle Repairs, or similar) remained until it closed in 1950. I was 10 years old and living in Byron St. I have a vague memory of the barber’s shop. Hello Dennis Fielder, I lived in Byron Street in the 1950s with my grandparents. They had a antique/junk shop and kept a horse. My grandmother was blind and so my grandfather didn’t work so much. Hi guys, I lived in the south middle section of Cowper Street from 1954 for about 20 years. Shops I remember are Moltons sweet shop, particularly 1p lollies and massive air bombs near Nov 5th, the Army Surplus shop on the north east corner, Muddle the piano repair shop near Moltons and the total lack of cars in the street as a young boy in the late 50s early 60s. I went to Connaught Rd Infants, Goldstone Junior, Hove Manor and Knoll School. A very sad day when GJ was demolished along with all of Ellen St including the cake shop on the corner and Bullens sweetshop. Colin, Cousin Marion has asked me to answer your query but I’m afraid this is the only photo we both have. I grew up in Byron Street in the 40s and 50s and I remember the Marsh cycle repair shop well, but our Uncle “Fred” Marsh had sold the business and retired long before I was born. Hi Colin. Henry John Lawson was a bicycle agent in the 1870s based in Preston Street. Do you know who the cycle maker was? Any help would be appreciated if you can. My interest is in researching this man’s life and work. My thanks. Does anyone remember the Cook family? They lived at no 78 where my dad (Allan Pumfrett) enjoyed holidays with their son Arthur. Would like to contact them if possible. Reference the Marsh Bicycle shop: In 1944, I owned a very fine racing bike made, I would guess, somewhere between 1910 and 1920. This was called ‘The Marsh Aerial’. I always assumed that my bike was an Aerial but could find no reference to a model like this. Could my bike have been made by the Marsh family? To Ron Charlton. It’s quite possible, Ron, that your racing bike was made by my great uncle Fred Marsh (Marsh Bicycles). I also had a racing bike in the mid 1950s that was handed down to me by my late Uncle Bob Marsh who was a nephew of Fred Marsh. To Keith Upward. Thanks for that piece of information. I think your belief is correct. I wish I had it now. It was one of the finest pieces of engineering I have ever come across. Light as a feather and smooth to ride. I do remember having an awful job getting a beaded edge tyre for it. Does any one remember the Laingchild family at 18 Montgomery St in the 1950s? 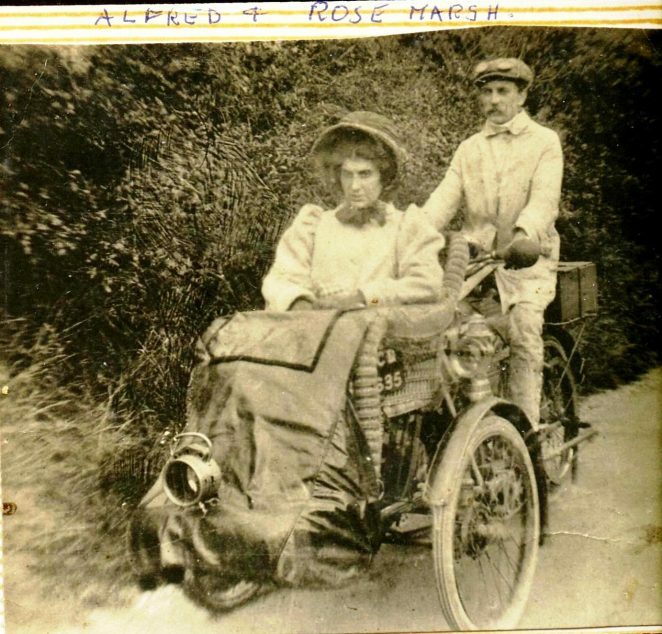 Does anyone know whether Alfred was related to Harriet Maria Marsh (b1889) daughter of George William Marsh (b1859), a Brighton waterman? I lived on 116 Cowper Street from about 1953 to 1966. I remember the sweet shop and the potato and veg shop at the far end and the surplus store where I bought my first khaki pants. I seem to remember there was still a bike shop there up until I left, selling mainly racing bikes. Opposite the sweet store was a family who had a golden retriever I used to take for walks. I also attended Hove Manor. In those days there was almost a shop on every corner and yes we could play in the street as there were not so many cars and they were quite small as well- not the horrendous 4WD of today. Does anyone know if a Marsh married into the Regans? Hi John Denny. I lived at 54 Cowper St and I used to be in the same class as your brother Martin. Also remember a shop on every corner, mostly with a little bell that tinkled when you opened the door. In the late ’40s – early ’50s, my grandfather, Herbert Thomas Saunders, had a leather boot makers and boot repairers shop at 41 Cowper Street – and that was on a corner with a little bell that tinkled. Does anyone remember what the shop on the corner of Byron Street and St Patrick’s Road was? I’m currently going to be moving to 90 Cowper Street, and have been told by the seller it used to be a sweet shop! Does anyone have photos of it as a shop? It was around very late 60s / early 70s when I used to go to a Mrs Cook’s cycle shop which I think was on the corner of Cowper and Westborne Streets. I was cycle racing at this time and bought a fair amount of ‘lightweight’ kit from this shop. I moved to Harrow in the mid 70s, continued racing, but never found out any more about this little shop. I also used Mrs Cook’s shop in the early 70s. I think it was on the corner of Westbourne and Wordsworth Streets. The shop on Cowper Street sold photo albums for wedding photographers. Mrs Cook’s was the only place to go for local club members, Saturday mornings usually being very busy. She had a sausage dog who always came to say hello when you went in. It was a tiny shop with her living room/kitchen behind the shop. I think her husband used to have a cycle shop in Red Cross St in Brighton – maybe she moved to Hove when he died. I have heard of Mrs Cook and “sausage dog” my husband’s favorite bicycle shop in 60’s 70’s. Brighton Cycling Club still having her congrats card for my son’s birth.